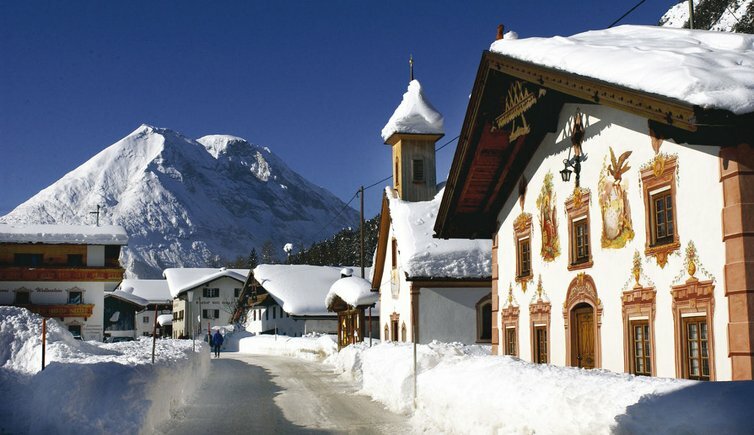 You may be wondering why I’m bringing this up over the holiday season but in the early 90s we were once again spending Christmas and New Year in Seefeld, Austria. This time, instead of driving from the UK, we’d flown to Munich and hired a car, a VW golf. After an overnight stay, we’d driven to the hotel on 23 December to discover the whole area was devoid of snow, although it was happily forecast for the coming days. On Christmas Eve my beloved and I drove down from our hotel into the nearby Leutasch Valley. We parked the car next to a telegraph pole and went for a very long walk which included pit stops for coffee and lunch. As my beloved locked the car door, I suggested he put the key in the zippered pocket of his jacket. As we set off, there was a decided nip in the air and the sky looked ready to drop plenty of the white stuff. We walked almost the length of the valley, a great area for cross-country skiing, before finally stopping for lunch in one of the many restaurants dotted around the area. We had set off for our walk after a plentiful breakfast at the hotel but the brisk exercise had given us an appetite and we’d lingered in the warmth of the restaurant before turning around and walking back to where we’d parked the car. By the time we reached the car, snowflakes had started to swirl and settle on the ground and the light was beginning to fade. As we reached the car, my beloved asked me for the car key. Normally I would have taken the key and put it in my handbag but I’d not taken one with me. I’d shoved just enough cash in my zippered pocket for refreshments and lunch. I often find that when I’m out with my beloved I’m something of a packhorse as he happily expects me to carry everything he wants to take with him while refusing to carry a bag or backpack himself. My way round this is to carry the bare necessities – cash, lip balm and a hankerchief – in my pocket. There was no point in retracing our steps as the grass was now blanketed with snow and the restaurant where we’d eaten lunch most probably closed. There was nothing else for it. We walked into the main area of Leutasch and got a taxi back to the hotel. Of course, we most probably wouldn’t have used the hire car over the Xmas period particularly now that it had snowed heavily. Our main method of transport would be our cross-country skis. After Boxing Day I contacted the hire company and explained our dilemma. I confess it was difficult to keep a straight face as I talked them through the problem and I’m pretty sure I heard a few sniggers at the other end of the line. No doubt our tale of minor woe would fuel a fair amount of amusement in the VW offices. They promised to organise a replacement key as soon as possible. A few days before we were due to fly back home, a rendez-vous was arranged where we’d left the car, which by now was completely covered in snow. Luckily we’d been able to pinpoint it using the telegraph pole although we now had to dig it out. Fortunately, the hotel had lent us a couple of shovels though I had to explain why we needed them. Cue more smirks! It took us quite some time to clear the car of snow but we’d just about finished when the replacement key arrived with a mechanic from the VW garage in Innsbruck. Unsurprisingly, the locks were frozen but he helped us to defrost them with anti-freeze and just like that we were mobile again! Happy New Year to you too and thank you for your kind words.